Sunpower portable solar charger - Shenzhen Sungold solar Co., Ltd. 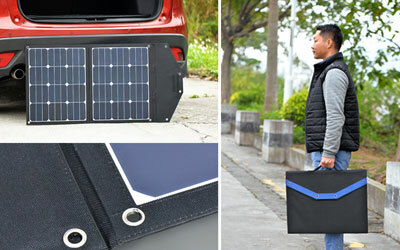 This product is a multifunctional Sunpower portable solar charger, High efficiency, we have 80W and 120W two items, provide free power for charging 12V batteries, for example in vehicles and boats, motorhome , caravan, camping, narrow boat, yacht etc, or any other systems with a 12V battery or battery bank. Now you can choose the kits type with a stand which is very easy to set up and fix. A handle and latches ensure ease of storage and portability. Storage case included with the kit is made with a layer of foam, so it will protect the glass and the frame well and prevent any accidental. Aplication: for charging 12V batteries, for example in vehicles and boats, motorhome , caravan, camping, narrow boat, yacht etc, or any other systems with a 12V battery or battery bank. Very easy portable solar charger, surported 12V rechargeable batteries. WARRANTY: Portable Solar Charger bag with 1 years warranty. High Conversion Efficiency: With SunPower solar cell, up to 22%-25% efficiency, which enable 23-25% higher power generation than the conventional PV modules at the same size, you will get greater power efficiency even though the panel is no larger than a traditional model. Foldable Design:it looks like a briefcase when folded. A handle for easy to carry, 4 metal reinforced mounting holes at each corner allow easy attachment to backpacks, trees, or tents. Highly Durable: Industrial-strength TPT polymer faced solar panels sewn into a rugged polyester canvas offer weather-resistant outdoor durability, great for any outdoor activities such as camping, climbing, hiking, picnic. We have a big range of Monocrystalline modules, ask us for yours!